This Agreement contains the complete terms and conditions that apply to you in joining, buying, using and all other activities you will make in accessing the ally-press.com website (“our website”). By accessing our website, you agree to be bound by these terms and conditions and shall comply thereof. This Agreement describes and encompasses the entire agreement between us and you, and supersedes all prior or contemporaneous agreements, representations, warranties and understandings with respect to our website, the content and computer programs provided by or through our website, and the subject matter of this Agreement. This Agreement posted on our website reflects the latest agreement and you should carefully review the same before you use our website. Ally-press.com reserves the right to change, edit, delete or modify any of the terms and conditions contained in this Agreement, at any time and at our sole discretion, without prior notice. YOUR CONTINUED USE OF OUR WEBSITE, VISITING AND SHOPPING IN OUR WEBSITE WILL CONSTITUTE BINDING ACCEPTANCE OF ANY SUCH CHANGES, ALTERATIONS, OR MODIFICATIONS. Our website allows you to obtain product and service information, place orders for products and services offered by ally-press.com online. However, you are prohibited to do the following acts, to wit: (a) use our website, including its services and or tools if you are not able to form legally binding contracts, are under the age of 18, or are temporarily or indefinitely suspended from using our website, services, or tools (b) collecting information about users’ personal information. Visiting our website, sending emails to us, or filling out online forms on our website constitute electronic communications. You consent to receive electronic communications and you agree that all agreements, notices, disclosures and other communications that we provide to you electronically, via email and on our website, satisfy any legal requirement that such be in writing. For you to create an account in our site, you must provide current and accurate information, your full legal name, current address, a valid email address, and any other information needed in order to complete the signup process. You also agree to maintain your account information so that it is current and accurate. You qualify that you are 18 years or older and must be responsible for keeping your password secure and be responsible for all activities and contents that are uploaded under your account. You agree to accept responsibility for all activities that occur under your account or password. You acknowledge that we are not responsible for third-party access to your account that results from theft or misappropriation of your account. We reserve the right to refuse or cancel service, and/or terminate accounts in our sole discretion. You are solely responsible for any files or materials you upload or submit to our website. By submitting files or materials to our website, you are confirming that you have full rights to copy, print, and mail the files and materials and you are recognizing that the content of the files does not infringe any intellectual property rights. You agree to indemnify, defend, and hold harmless ally-press from any claim, suit, or demand. Artwork files and materials submitted to our website are considered print-ready and will be printed as is unless a proof has been ordered. Ally-press.com assumes no obligation to review files or materials submitted to our website and you are fully responsible for ensuring that their files and materials are proofed before uploading or submitting files to our website. Your submission of files and materials to our website confirms your agreement to print your files or materials “as is”. If a proof has been ordered, note that color proofs cannot match the final printed product exactly due to the nature in which proofs are produced versus the way the final job is produced. All proofs incur additional charges, and changes after a proof has been produced also incur additional charges. Customer supplied proofs will not match our proofs or the final produced job. Linked sites are not under the control of ally-press.com and we are not responsible for the content of any linked site. Ally-press.com has the sole discretion to provide the terms of payment. Unless otherwise agreed, payment must first be received by ally-press.com prior to the latter’s acceptance of an order. Unless credit term has been agreed upon, payment for the products shall be made by PayPal. Invoices are due and payable within the time period noted on your invoice, measured from the date of the invoice. An order may be invoiced separately. Ally-press.com has all the discretion to cancel or deny orders. Ally-press.com is not responsible for pricing, typographical, or other errors in any offer by ally-press.com and reserves the right to cancel any orders arising from such errors. For orders where terms have been given, invoices must be paid in full within 30 days of the invoice date. Ally-press.com reserves the right to charge you a late penalty charge of 1% per month applied against undisputed overdue amounts or the maximum rate permitted by law whichever is less. Every 30 days thereafter, you will continue to be charged an additional late penalty charge. You have 10 business days from delivery of product, to notify us of any defects. You must return 100% of product within fifteen (15) business days, at your expense, from when you have received the product. If we have not heard from you after ten business days of receiving product, it is considered satisfactory to you and no refunds or re-prints will be issued. If product is found by us to be defective as a result from services rendered by us, a credit will be issued or a re-print of product will be started within 24-48 business hours. If a credit is given to you, this must be used within six months from date of credit issued. If you want to cancel orders prior to processing and monies were dealt with at time of ordering, you will get full refund of your monies. If the processing of the order has started, the refund monies will be issued minus the services rendered. An order cannot be refunded if order is cancelled after all services rendered. The price displayed for products on our website represents the price estimated in accordance with standard industry practice. In cases of incorrectly priced items in our catalogs in which the item's correct price is higher than our stated price, we will, at our discretion, either contact you for instructions before shipping or cancel your order and notify you of such cancellation. We will not be liable for indirect, special, or consequential damages, or any loss of revenue, profits, or data, arising in connection with this Agreement or our website, even if we have been advised of the possibility of such damages. We make no express or implied warranties or representations with respect to our website or any products sold and offered in our website (including, without limitation, warranties of fitness, merchantability, non-infringement, or any implied warranties arising out of a course of performance, dealing, or trade usage). In addition, we make no representation that the operation of our website will be uninterrupted or error-free, and we will not be liable for the consequences of any interruptions or errors. This site and its information, contents, materials, products and services are provided on an “as is” and “as available” basis. You and understand and agree that your use of our website is at your own risk. You agree not to disclose information you obtain from us, our website, and or from our clients, advertisers and suppliers. All information submitted to us by an end-user customer is proprietary information of ally-press.com. Such customer information is confidential and may not be disclosed. Publisher agrees not to reproduce, disseminate, sell, distribute or commercially exploit any such proprietary information in any manner. Failure of ally-press.com to insist upon strict performance of any of the terms, conditions and covenants hereof shall not be deemed a relinquishment or waiver of any rights or remedy that the we may have, nor shall it be construed as a waiver of any subsequent breach of the terms, conditions or covenants hereof, which terms, conditions and covenants shall continue to be in full force and effect. Accepted file formats – The preferred method for file formats is a print-ready PDF. We also accept tiff (as a flattened file) and eps files (with the fonts converted to outlines). Fonts – Embed fonts in a PDF, flatten tiff files, or convert fonts to outlines in eps files before submitting any of these file types. Full Color – Use CMYK (cyan, magenta, yellow, black) color mode when creating full color files not RGB or PANTONE. Printing uses the CMYK color mode, so they will be converted to CMYK during printing. If you are using RGB or PANTONE color modes your colors will change during this process. Spot Color – Use the PANTONE color matching system to set up your spot color files not CMYK. If a file is sent in CMYK, there are additional charges to correct and your file will not be accepted as print-ready. Bleeds – If your image needs to extend to the edge of your printed sheet, a bleed must be included in your file. We require a bleed of 1/8” on all four sides. Export a PDF with 1/8” bleeds and without crop marks or printer’s marks. 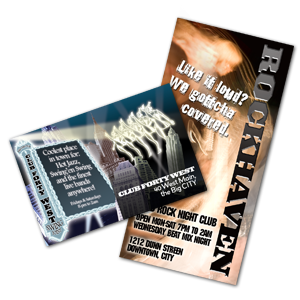 For example, an 8.5 x 11 brochure with 1/8” bleeds would give you a final artwork size of 8.75 x 11.25. Images – Use a minimum resolution of 300 dpi for images. Lower resolution images will be blurry or pixelated when printed. Images used from web pages are 72 dpi and are too low resolution for printing. 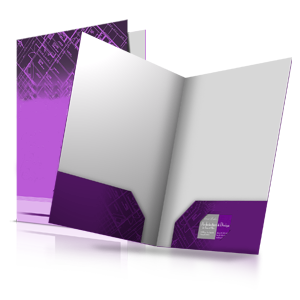 Multi-page documents – These should be submitted as a single PDF file with multiple pages in the exact order that you want them printed. Solid black areas or rich black – Make sure these are a rich black with the following color values: 40% cyan, 40% magenta, 40% yellow and 100% black. Note: this is only for large solid black areas, DO NOT use rich black for text or lines. Borders – We do not recommend the use of borders. However if a border must be used, it must be a minimum of ¼” wide in addition to including a 1/8” bleed. Please note that it is not possible to guarantee perfect trimming of borders due to the printing and finishing processes used. 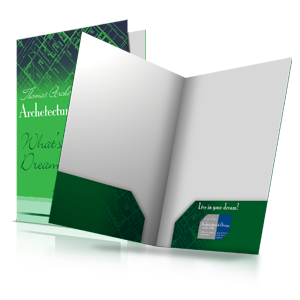 Folded brochures – Using our design templates will assist you with setting up folded brochures accurately. 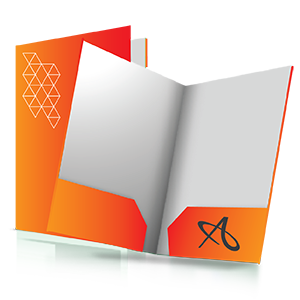 Saddle-stitched booklets – Make sure your critical text and images are well within the safety line when setting up your artwork for booklets. Creeping does occur as the inside pages get trimmed more than the outer pages and there is more of a chance of your artwork being trimmed off. 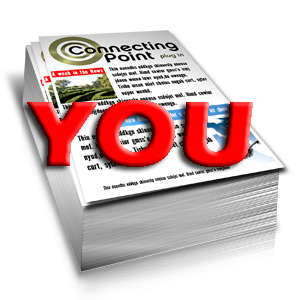 Increase your safety zone as you design your inside pages. Post Office Guidelines – The Post Office has strict guidelines that must be followed in order to mail using bulk mailing services. You must make sure that your mail piece follows those guidelines for indicia, address area, artwork size and aspect ratio.